After all the struggles of two old fat guy getting the new 88# AC into the through-the-wall over our heads, we discovered we had a dud. Like many new appliances, this AC had one of those built-in GFCI modules on the end of the power cord, and ours is bad. The Reset and Test buttons are loose and the power light on the module is dead. So the company is sending us a new one, which we should get sometime next week. But unfortunately they’re not sending out two young, burly guys to remove the old one and install the new one. We asked. So we get a second shot at heart attack territory. Since that was about it for work today. I thought I repost some more train stuff from our visit to the Strasburg/Lancaster, Pennsylvania area in July 2009. 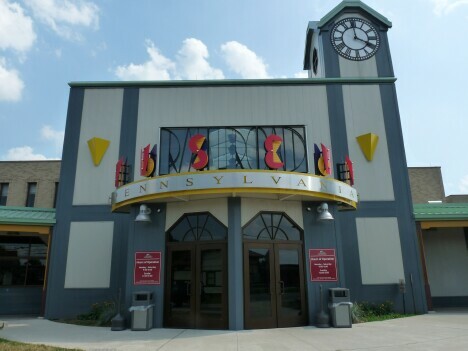 The indoor part of the Railroad Museum resembles a large railroad station, with multiple tracks full of trains. This is the John Bull. It’s a replica of the first locomotive to run on a railroad in America. 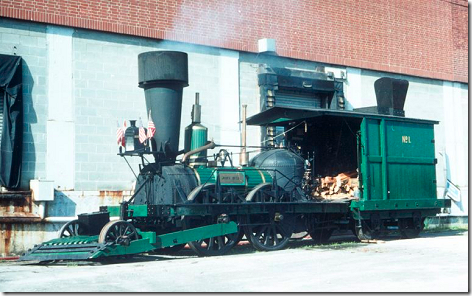 In 1831 the first railroad was built between Philadelphia and New York and the John Bull was the engine. It’s hard to think now of how this revolutionized travel in the US. It cut the travel time from Philadelphia to New York from 2 days by coach to 5 HOURS!. It’s hard to do that by car now. I saw this same locomotive last week in the Smithsonian, but wasn’t able to get close enough to read the display due to the crowds. I was surprised to learn here that the one I had seen in the Smithsonian was the REAL John Bull, from 1831. It ran a regular route until 1866, then traveled around the US on exhibitions until it was donated to the Smithsonian in 1884. This beautiful example of a 2-6-0 Mogul locomotive carried silver ore on the Virginian & Truckee railroad in Nevada from 1875 to 1944. The ‘2-6-0’ type of nomenclature describes the layout of a locomotive’s wheels, and only applies to steam type locomotives. The Mogul above has 2 small wheels up front, 6 drive wheels in the middle, and no small wheels in the rear. Thus, it is a 2-6-0. This locomotive #7002, dates from 1902 and was the first one in regular service to exceed 100 mph. Note that this one is a 4-4-2, although you can just barely see the 2 wheels under the tender at the far right of the photo. Arguably the largest locomotive ever built was the ‘Big Boy’ built for the Union Pacific to pull large coal trains up and down the Rockies out West. Note that this one is a 4-8-8-4. That’s a lot of wheels. Below is a type of locomotive I’d never heard of. This one is unusual in that it doesn’t have a boiler or generate its own steam. It’s basically just a big thermos bottle. It’s filled up with live steam from a stationary boiler and then operated, usually in the rail yard, until it needed to be refilled. Outside it was even better. It was a rail yard full of more trains. And it has a real operating roundtable, used to move locomotives in and out of the yard. And a rail crane used to lift derailed engines and cars back on the track. I’ve always been fascinated by the big steam engines and this was a great chance to see them up close. Potatoes make French Fries, Chips, and Vodka. It’s like the other vegetables aren’t even trying. 2 Responses to All Aboard! Surely your boss knows of a couple of strong young guys he could hire for an hour to take out the nonworking AC and get the replacement put in it’s place. It’ll cost a few bucks and maybe some beer, but that’s better than the two of you hurting yourselves doing something you know isn’t wise for you to be doing. We were at the National Railway Museum, Green Bay WI last week and saw the 4017 Big Boy they have there on display. One is Awe struck when you first see its immenseness. There’s a film there showing the restoration of BB 4018 that is now running around the USA now on exhibitions.